Andrzej Dominiczak, How to Grow an Elephant? HOW TO GROW AN ELEPHANT? I am not a believer. In any sense of the word. I do not believe in human rational potential, nor do I believe in freedom, dignity or human rights. I do not believe - I know! I know that rational thinking provides the best possible way of discovering the universe and the best way of understanding human life - social and individual. I also know that it provides the best methods to solve human problems and the best tools for planning progress toward a happier future. As regards freedom, dignity and human rights, I know that they all constitute the necessary precondition of such organisation of the human world in which the human potential is realised to the benefit of the individual and the community at large. I know and I understand, but I do not claim that this knowledge and understanding are of scientific character. They are, however, based on the same principles of cognition on which the scientific method has been built, and they have been time and time again verified so conclusively that they should be at least granted the status of "instrumental knowledge", which could form the solid basis and justification of our actions. Despite these apparently rationalistic claims, the humanism I advocate is equally passionate and fired with strong will. As a philosophy of freedom and ethical system that gave rise to the idea of dignity for all, humanism must be vigorously involved in the defence of rights and liberties and it must be wrathful always, when people are humiliated or enslaved by other people. I do not, however, share an opinion that humanism of this century has to be an angry humanism. If we truly are the children of reason, we should simply be more flexible: angry - when necessary, compassionate, if need be, open to dialogue when both sides share goals and values, and ironic, in the sense ascribed to this concept by Richard Rorty, to prevent our community from stagnating and becoming excessively moralistic. Should humanism be concerned with cosmological questions about the origins of the universe? Is it true, as Babu Gogineni asserts, that humanism is nothing, if it is not a continuous interrogation about our universe and our place in it? No! We should not try to answer all questions. Here lies one of the many differences between humanism and religion with its totalitarian tendency to embrace all aspects of human life. Scientific questions should be left to scientists. Of course, we must use their findings to deepen our understanding of the world and improve the quality of our lives - not without some kind of scrutiny, however. Despite our full support for the ideal of scientific inquiry, we must not create a religion of science. Particularly, we should not worship science as a social institution, as it is often a victim to the same common fallacies as we all are, or to the fallacies created by its own specific culture. As Bertrand Russel once said: University life is so different from life in the world at large that men who live in academic milieu tend to be unaware of the preoccupations and problems of ordinary men and women.[...] Academic institutions, therefore, useful as they are, are not adequate guardians of the interest of civilisation. Indeed, there are good reasons not to abstain from criticising science - on no account, however, may we refrain from criticising religion. Humanism, despite widespread misconceptions, has nothing in common with religion, although it is true, as Fragell pointed out, that we are concerned with the same kind of deeper questions as traditional religion. I do not think, however, that it is the pursuit of truth that is most important to us, not its possession. Humanists are as interested in possessing truth, as the religious. Humanists, however, know that the only way to truth leads through joint scientific pursuit. What we really reject, in clear opposition to the religious, is the illusion of "absolute truth", dangerous and powerful, as it appeals to people's most intrinsic need for the sense of life, thus constituting a handy tool for those who seek control of our way of thinking. The principal difference between humanism and religion lies in the "methodology of the inquiry". We refer our "deep questions" to ourselves, while the religious ask their supernatural authorities or rather their self-appointed, earthly representatives. We expect the answers to be based on evidence obtained in fully controlled conditions, to be coherent, to be double or triple checked - they accept them merely by virtue of faith. What makes the method of religion particularly pernicious, however, is its aversion to doubting - this first source of free inquiry. The faithful are not allowed to raise doubts, as most deities, for some reason, find them highly offensive. Humanists, quite on the contrary, are obliged to question any findings, to verify any claims and to look for better theories providing more reliable answers to their "deeper" questions. In the paragraph devoted to deepening our identity, Babu Gogineni says that humanist groups should be open only to humanists, because we have shared objectives to pursue and common goals to attain. Fair enough, but what about those faithful who declare their full support for our goals and objectives? Over the years, we have been approached by a number of religiously minded persons who expressed their wish to join our organisation. They agreed with our "declaration of values", thus meeting our operational definition of a humanist, as anyone who entirely accepts its content. Why should we close our doors to them and how could we justify this decision? Finally, we invited them to our association on condition, however, that they do not believe in Hell, as - in our opinion - the idea of eternal punishment is more incompatible with the humanist worldview than some vague need for sacrum they seemed to suffer from. With time, what was first meant as a semi-humorous, provisional solution, turned into standard practice, particularly when we realised that our activities were not in any way hindered by their presence. On the contrary, they supported even the most controversial projects that were finally rejected by the majority of "genuine" humanist. They backed the proposal to launch a humorous campaign to clone the pope and supported a project to file with a Constitutional Tribunal a motion to outlaw the Catholic Church as an institution clearly practising and supporting discrimination against women and sexual minorities. I do not claim that this is an ideal solution for all. I simply want to say that we should avoid the tendency to adopt seemingly obvious, rough solutions, where more subtle, creative and friendly solutions are possible. Generally speaking, it is this shortage of creative solutions, creative thinking and creative vision that I miss most in both contributions. 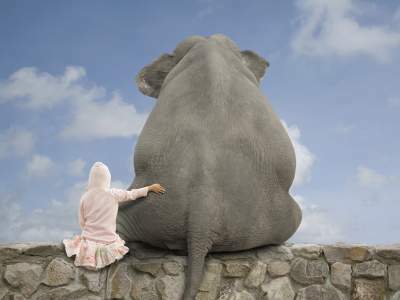 If we really want to grow our "humanist elephant", we need more courageous and visionary thinking, which - in my opinion - is as important as "optimism of will" and probably more important than a better name for our international organisation. Creativity that I have in mind should mostly take the form of concrete, spectacular projects, which might appeal to people's imagination, hopes and hearts. This is not meant to diminish the role of programmes aimed at meeting basic human needs, as the need for life-cycle ceremonies or for care services during life crises, whose importance is so convincingly shown by Levi Fragell. It is a mere suggestion to enrich our philosophy and politics. Levi Fragell ponders, why a rapidly growing number of unbelievers in the world does not lead to the proportional growth of the humanist movement. He submits that many idealists and humanists who feel obliged to support our work do not join humanist movement, because the world is full of good causes and many humanists may feel that we have not always chosen the most essential ones. Fragell believes that many of those who have lost their faith replaced their religion with some kind of subtle secular morality and a strong sense of social solidarity. I am afraid that this picture is far too bright. It is rather moral and social indifference that prevails among the new unbelievers. What today's believers as well as unbelievers expect from life is rudimentary excitement and satisfaction derived from defeating their neighbours in a global "win or loose" game. This is the main reason that millions of unbelievers do not join the humanist movement or any other movement. They do not care, neither about humanism, nor about any other "ism". In my view, it is this moral and philosophical apathy and nihilism that we must be ready to challenge in the future, if we really want to replace faith and obedience with reason and compassion. What About Suffering and Happiness? Lastly, I would like to refer briefly to "suffering" and "happiness", these two basic forces in our lives, almost entirely ignored by both authors. Contemporary humanism has been based on the idea of inherent dignity of all members of the human family - emotional dimension of human life, however, somehow escaped our attention, although, as compassionate naturalists, we simply can't deny the importance of joy and pain as universally understood experiences shared by all people. The concept of dignity in its modern sense is rarely understood and has been in fact rejected by many philosophers as a notion deprived of sense. I don't agree with this view (social sciences tell a lot about human dignity), but there is no doubt that we have not yet succeeded in devising a satisfactory definition of dignity. Additionally, humanist and religious concepts of dignity are entirely incompatible: the former has been derived from the concept of human cognitive and moral autonomy, while the latter, quite on the contrary, from the lack of any intellectual or moral independence. This is not to say that we should abandon speaking of dignity altogether, we should, however, be aware of its deficiencies and the of difficulties arising from its confused sense and status. To understand suffering and happiness we need no words at all. Even Christianity has not succeeded in corrupting their meaning, although it created the whole mythology to justify its perverted and politically motivated ethics of suffering as a positive value and happiness as a posthumous promise for the meek. Indeed, it is this morality of slaves that has been the main cause of human misery throughout the ages. Humanists must never forget this basic truth and must never cease speaking about human suffering and happiness, while pursuing their more intellectually sophisticated goals. Andrzej Dominiczak is a founding member and the president of the Polish Humanist Association and executive director of the Club "Sapere Aude" - the Polish section of the Center for Inquiry Transnational. He is also an author, translator, editor and publihser of humanist books.